There will be more on the election results coming from us soon, but for now, we share your grief and rage and determination. We hope that you will come be with us in person, not just in the streets but at these community gatherings, both of which are deeply related to what happened in the election and what’s next. What we learned about organizing against racism in states where the far right is dominant and explicitly white supremacist forces are organized. need to center poor and working class white folks in building multi-racial, multi-class anti-racist movements. We look forward to talking with you as we connect anti-racist struggles across geography and culture. You are also invited to stay after the reportback to help make sure this work continues. Join us for a mailing party! Do you like to use decorative stamps? Do you like to chat about the political moment while handwriting addresses to the many supporters of Catalyst? RSVP: invite your friends on Facebook and email intern@collectiveliberation.org to say you’re coming. This event is sliding scale $0-30. No one turned away for lack of funds. This event is wheel chair accessible and will be a low scent space. Please RSVP by November 3rd if you would like child care support. **We are having another mailing party November 20th in Oakland if you are not able to make the above event, but would like another chance to join us. Email molly@collectiveliberation.org to RSVP. 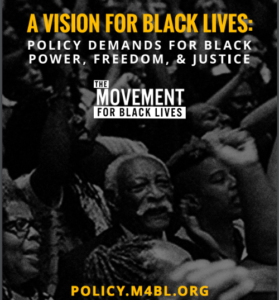 Join Catalyst Project for a study session on the #Vision4BlackLives policy demands. The vision and leadership of organizers in the Movement for Black Lives challenges all of us to step up our commitment and work— let’s talk about how to do that concretely! This event will primarily be facilitated small groups focused on getting aligned and active with this transformative document. Our discussion will assume participants have read the document, so please do so beforehand, and/or join us for the first hour dedicated to reading. $10-30 donation requested; no one turned away for lack of funds. This event will raise funds for local M4BL groups. Wheelchair accessible; childcare provided upon request. We are asking that everyone who is planning to come be fragrance free so that people who have chemical injuries and related illness can participate. For more on what that means and how to do it, please visit: http://eastbaymeditation.org/accessibility/scentfree.html. If you need childcare, or have questions about these or other access needs, please contact will@collectiveliberation.org before November 19. 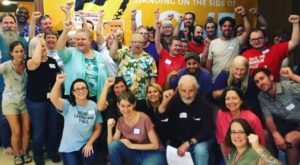 Catalyst Project supports multiracial movement-building for collective liberation by organizing, training and mentoring white people to take action against racism, war and empire. 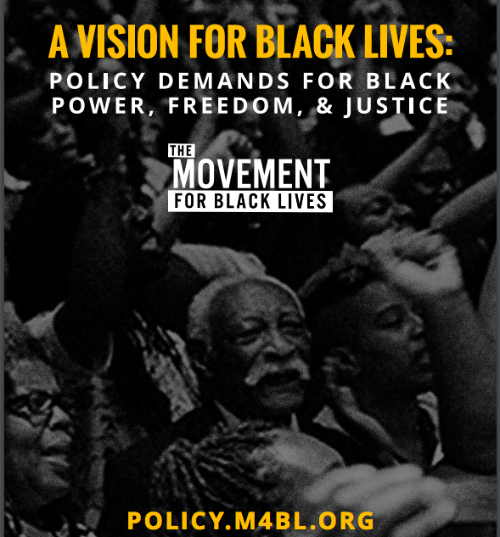 This event is open to anyone interested in studying the #Vision4BlackLives.